As the new tax regime has started disrupting the ground, the state government is grappling with a series of issues from the status of Lakhanpur to various concessions that were fundamental to the industry growth. Unlike mainland India, where the GST has started impacting pricing of FMCG, not a major alteration is witnessed in J&K. One major factor could be that most of the routine consumables were either in low tax bands or certain services were excluded from the tax net. Right now, a dinner out of home and a recharge in a phone, everything is costly. Certain sections in trade and industry see the continuation of toll at Lakhanpur as a major aberration of the GST and see it a contributor to the price hike of items. Though the government is yet to come out on the Lakhanpur front, indications suggest that the toll post shall remain as a gateway to monitor movement. There is a possibility of its use as a symbol of state’s exclusive rights to guard the local market which may include special taxes or even outright ban on certain items having a possible impact on home produce. But to reach that level of policy shift, the state may have to seriously see how toll tax can be managed without fetching trade a reason for price escalation. Right now, the manufacturing is seriously impacted. Manufacturers supplying to the home market are not doing any kind of billing. Those supplying outside the state have ceased production. The real big issue, however, is the continuation of incentives to services and manufacturing sector. Right now, the manufacturing is seriously impacted. Manufacturers supplying to the home market are not doing any kind of billing. Those supplying outside the state have ceased production. Interestingly, local pesticide manufacturers have reportedly stopped production thus paving way for non-local manufacturers to get into the market. Increased tariffs in the state, courtesy GST, have made the locally produced pesticides slightly more expensive especially after the incentives they were getting were devoured by the new tax regime. In run up to the GST implementation, the state government has reiterated that the concessions to the industry, especially the excise part, subsumed by the new regime, will continue. This is a decision taken at the GST Council level because various states were enjoying concessions. But the governments in Delhi and Srinagar have to create models for implementing the promise. Officials say it is work in progress. Industry boosted when the then Prime Minister Atal Behari Vajpayee on November 14, 2002 announced a decade long package aimed at helping state manage its massive unemployment and manage its infrastructure deficit. Apart from 100 percent excise duty refund for new ventures and substantial expansion of the existing ones (25% additional expansion); the package offered capital investment incentive of 15 percent within three million rupees ceiling; full reimbursement of insurance premium on capital investment; and three percent interest subsidy on capital investment. Besides, the investments were exempted from income tax for five year with concessions for later five years as well. Besides, the state government would offer a set of 24 concessions to the industry from its own resources. With two packages operating simultenouslyt, it attracted some of the major industrial houses into the state, mostly in Jammu, Kathua and Samba. It was much later that local investors in Srinagar followed the suit. They, however, had to fight for a long time to make the incentives location neutral. Industry ministry sources put the overall investment in the small, medium and large sectors at Rs 8070 crore by the end of March 2016. For major industry Excise Duty refund was the main attraction. At one point of time, on the recommendations of the Revenue Intelligence, the central government made quick amendments in the package. On March 27, 2008, an amended notification devoured part of the excise refund and permitted it to the level of value addition only. It reduced the refund off take from an average 10-14% to 0.5 to 1.5%. Despite the amendment, it continued to be an attraction. By the end of 2015-16, the sources in erstwhile Central Excise said that it had refunded an amount of Rs 5963.47 crore in J&K, mostly to the industrial sector. Central government tried to make the refund taxable but it lost the case in the Supreme Court. By the end of 2015-16, the sources in erstwhile Central Excise said that it had refunded an amount of Rs 5963.47 crore in J&K, mostly to the industrial sector. Central government tried to make the refund taxable but it lost the case in the Supreme Court. Since J&K is a small state and not everything produced here is consumed locally, the J&K government has been linking the investment to the job creations. But the lack of skill sets to the local unemployed has been a major grey area. It was this situation that led to the amendments in the industrial policy permitting investors to get the skilled manpower from outside the state. But in GST era, industry is expected to face new challenges. Right now, most of the products produced locally can be slightly expensive compared to their non local rivals. As the GST has subsumed most of the concessions, the state government will eventually have to find a way out. But GST has an inherently interesting system. It takes part of the tax to the end consumer and that was the key factor why most of the manufacturing states were unwilling to adopt it for most of the last 15 years. J&K is not a hugely manufacturing state but whatever it manufactures it takes a real effort and lot of resources. But what is interesting is that almost 90 percent of its manufacture moves out of the state. With that moves part of the GST benefits too. That is the dilemma, post GST. Now the issue is that if Rs 1 crore investment from public kitty, creates x number of jobs in the industry sector, is it more, less or equals the rational expectations. If it falls much below that, then state planners say it may require a rethink. If public investment of the state in private sector does not help it manage part of the unemployment load, then planners will have to rediscover another strong reason to keep the concessions Raj intact. But what are the options? One possibility is to encourage the industry that secures its raw material from outside and supplies within the state. Another possibility is to add to the incentives to the units which have mass local employment. Yet another possibility could be preventing certain goods into the state so that local manufacture retains the market without competition. Since the GST has given a level playing field to entire industry, apparently to the disadvantage of the smaller players like J&K, there is a possibility of improved investment in overall infrastructure by debt to the huge kitty that the two governments have been setting aside for industry, over the years. A strong probability is to identify the requirement of the state market and invite industry to help substitute imports. But the state being a very small one, the economies of scale concept will be lost. 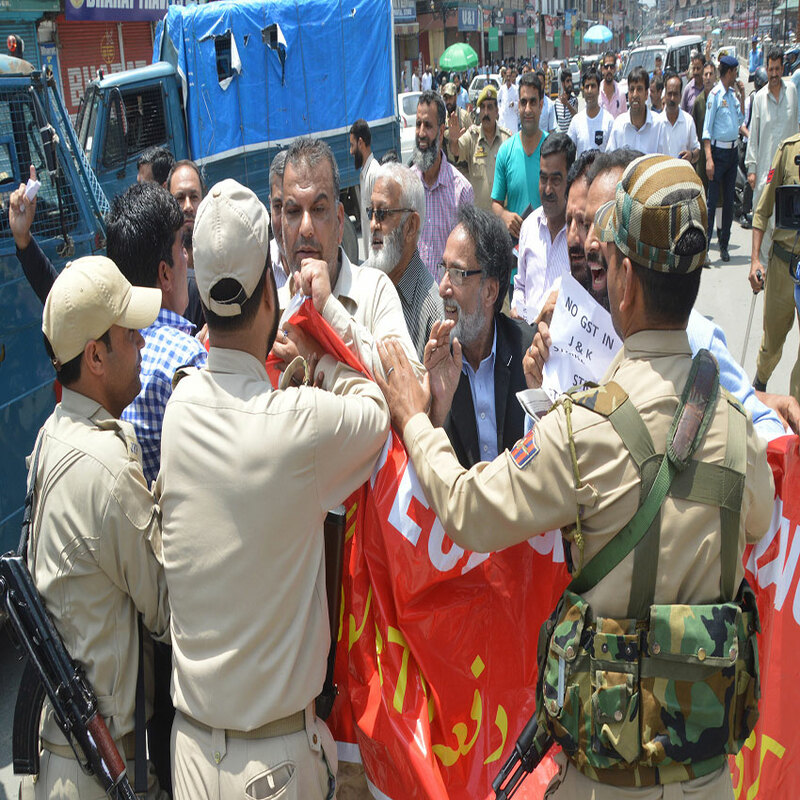 But before the internal debate within the state policymaking is over, there is desperate requirement for fast-forwarding the process that can help J&K restore status quo ante. A closed manufacturing sector especially that supply to the plains of India could be a closed opportunity for thousands of youth who are currently employed in these units. 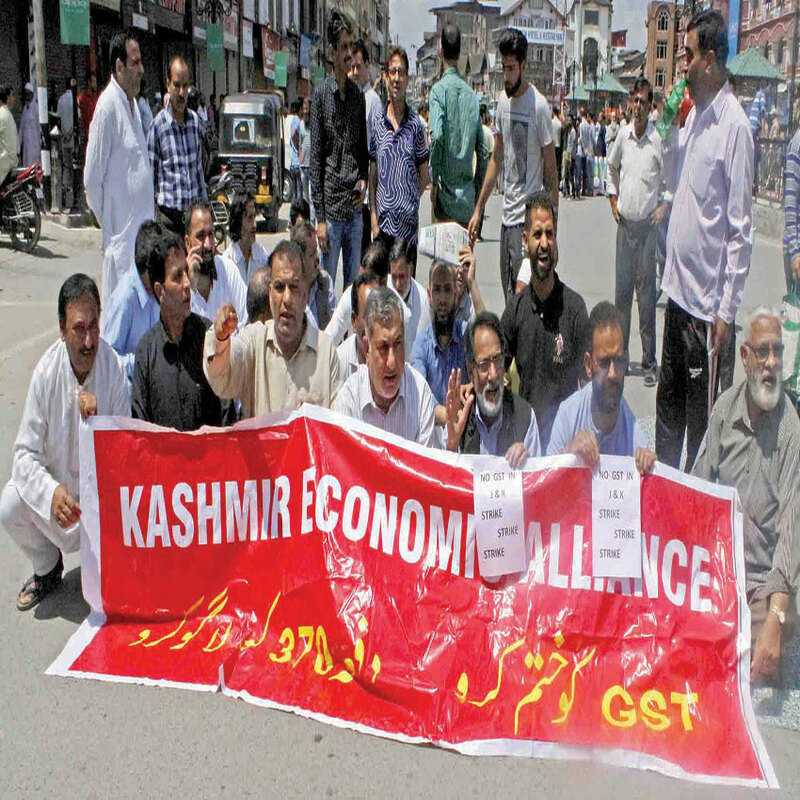 Manufacturers in Kashmir insist they are working on basis of the promise that the post-GST Q1 tax submissions would be kept in the GST vaults and counted every quarter to help GSTN stay happy.